MTB fat bike shop: everything for big tires! Fatbikes - Fat Tire Bikes - these bicycles live it up. They plug through any terrain without having grip issues! In our shop you can find not just fat bikes, but fat bike parts and accessories as well. It is unquestionable, these huge wheels look really aggressive! Some people love them and see them as a new trend in mountain biking, some people want them to disappear for good. No matter if you like them or not, if one of the fat bikes comes into your field of vision you look its way! Big wheels, huge tires and lots of grip even at the muddiest or snowy tracks. These bikes roll over bumps like without any problem, bulldozing their way towards your fun. The driving experience can not be compared to a regular bike - it's like driving a monster truck. It becomes common to see groups of fat bike riders in the woods ripping through mud, sand and snow. Fat bikes are not only available in 26 inch, 650b fat bikes start spreading as well. The fat bike tires make you benefit from the extra volume so they have the same or even bigger contact service as 29er tires. Therefore it is not surprising that the manufacturers follow the trend and try to improve the bikes in every area possible. In early times only rigid forks and frames were available, but now there is a huge selection of suspension forks and frames and even carbon frames become more and more available to reduce the weight of the bikes. Surly have invented a new bike category with their Krampus bike: it is called "Plus". Plus bikes are bikes with 2.8-3.0" tires and wide rims which offer enough support for the tires, usually the rims are about 50mm wide. Plus sized wheels have a bigger diameter and a way bigger volume then regular 29" wheels. The advantage is that the bike stays simple and suspension is not that important - but of course welcome. The contact area of the tire is increased which makes the brake force higher and the grip improves dramatically due to lower pressure in the tires. No more grip issues when doing the uphill - your tires stay glued to the ground. A difficult descent? Not so difficult with plus sized tires. It is not only much fun riding a plus bike, it offers more stability than regular cross countly or all mountain bikes as well. If you'd like to convert your bike to plus sized tires it is no problem going from 27,5" to 26plus, but it is not as easy to go from 29" to 650b plus as 29 inch wheels have a way bigger diameter than 27,5" plus wheels but are way thinner. The smaller, but more bulky tire might not fit into your fork and rear chainstays. We might be able to help you to decide here, just ask us for advice. Kids' fat bikes have tiny but fat frames, wheels and forks and will make your children love the rumbling of a mountain bike. 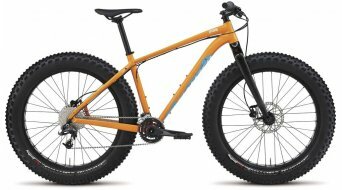 Check out the 20" fat bikes for kids such as the Specialized Fatboy 20"! Where does the fat bike trend come from? In the US fat bikes could be found in shops from 2005. It was not before 2012 / 2013 until fat bikes have become available in Germany as well and have intrigued the masses at the trade fairs. It's a growing market which will find even more fans over the next years - don't miss the trend and let us inspire you with our passion for fat bikes!